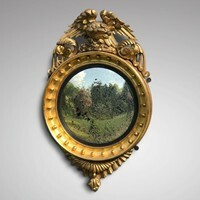 A beautiful 19th C. Landscape Mirror, with lovely bright gilding, original mirror plate and backboards. The frame having a stepped cornice with intricate and crisp detail. The side pillars fluted with fern leaf capitals, followed by floral motifs to both the top and bottom rail. English, Victorian.